scrumdilly-do! : Valentine's Day: Barely Baked "mallomars"
Valentine's Day: Barely Baked "mallomars"
These cheater cookies are super duper easy and sooooooo good! 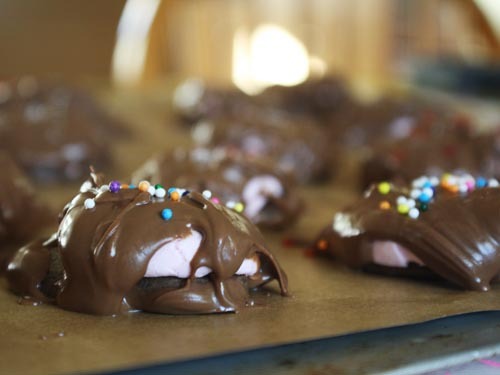 I would not recommend them as a giveaway treat, the chocolate coating melts like crazy but if you wanted to whip up a little fun for you and yours, this is an awesome project that you and your kidlets can do together. Set oven to preheat at 350 F and assemble to goodies. 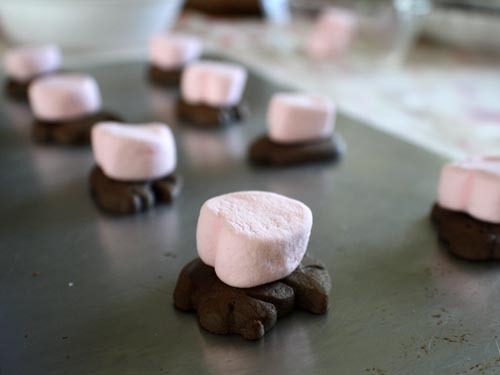 Have your kidlet place cookies on cookie sheet and top with a single marshmallow each. You can cram as many as you like onto your sheet. I think I got twenty on mine. Any cookie could work, but think smaller rather than large. When oven is preheated, pop the whole kit and caboodle in and set timer for two minutes. I make these cookies form scratch often but there are simply too many steps to simply whip them up. When I spied a bag of heart shaped strawberry flavored marshmallows I wondered if I could make up a cheater batch and this it what I came up with. 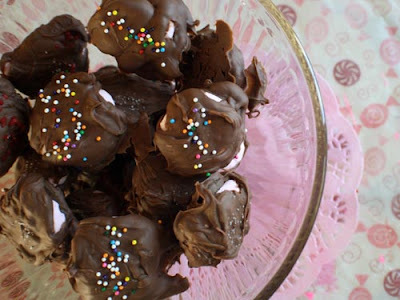 I used chocolate animal cookies simply because the price was right, they were small and they were chocolate. . Meanwhile, dump chocolate chips into top of double broiler, set flame to low and allow the chocolate to melt. You can also do this in the microwave which might work better since a smaller container allows for easier coating. Don't let the microwave go too long, it is really easy to burn the chocolate and then it is no good at all. After two minutes, remove cookie sheet from oven and place on top of hot pads. The marshmallows will have puffed up with all sorts of ooey goodness inside. Use a spatula to gently flatten each marshmallow. Your kidlet may do this part if you think they are old enough to mind the heat of the cookie sheet, otherwise this a job for the grown-ups. 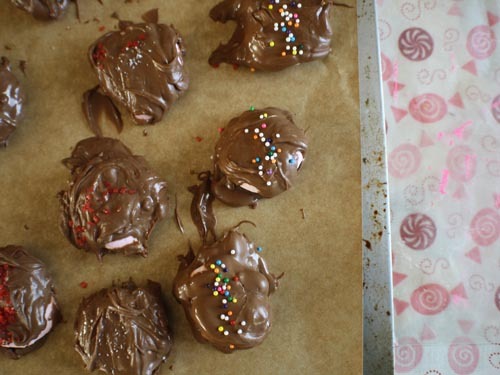 While the chocolate is melting and the marshmallows are cooling, have your kidlet pull out the second cookie sheet and top with a sheet of wax paper or parchment. Turn burner off when chocolate is all melted. Working as quickly and as carefully as possible, coat cookies in chocolate by dipping them and letting excess sloop off. The chocolate will be warm if not hot so this too is a job for the grown-ups. I'm a bit impatient when I do this and strive for simple coverage as opposed to pretty coverage. I plop the cookie into the chocolate and use a combo fork/wooden spoon to drag as much of the chocolate on top as I can. Then I use the fork to bring it up out of the pan, scraping the bottom against the lip before plopping the sticky mess down on the parchment paper covered cookie sheet. As you dip and drop, have your kiddo decorate with jimmies and sprinkles and such. If you are making these for grown-ups as well, a pinch of sea salt is my favorite topping. Semi-sweet chocolate works too. After all of your cookies have been dipped and decorated, make room in the fridge for the cookie sheet and pop them all in for a chill. This will help the chocolate set and keep little fingers off of them while you all clean up. 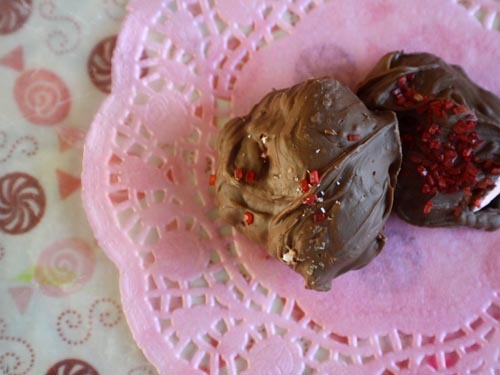 If you must, hand over the wooden spoon full of chocolate and let your kiddo go to town. After 20 minutes or so, enjoy one or two (but not three, three is overkill) with a glass of your favorite milk beverage and count the hours before you can indulge again. Happy almost Valentine's Day! Loooooooooooove it! Those look YUM!!! thanks for so many great ideas. This is O's first year for a V-day celebration at school so I am in search of fun and easy ideas. These are great! Valentine's Day: Heart Shaped "buckets"